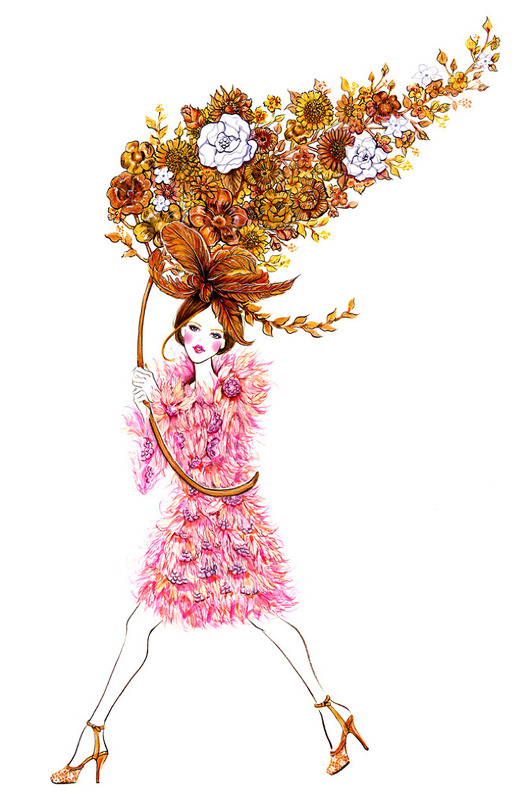 Marking our 2nd anniversary, we are proud to present the lovely illustration drawn by fashion & beauty illustrator Sunny Gu. Born in China and based in Los Angeles since age 13, the incredibly talented artist has been known for producing works for well-known fashion magazines. From the likes of Vogue magazine, Dolce & Gabbana’s Swide magazine and other publications from Conde Nast, she has been commissioned by notable brands and retailers as well, such as Bloomingdale’s, Shiseido and HBO, to name a few. One of the main aspect of her work that draws people in would be the incredible splash of colours in her illustration. While a typical fashion illustration can be defined as a fashion figure drawn with a few sketch lines and a subtle dose of colour rendering, Sunny on the other hand makes every effort to accomplish the full effect and vibrancy of the clothes or collection that she is referencing. Be it the keen attention that she pays to the smallest and most intricate detailing, from the fine hair of feathers to minuscule clusters of beads, or even the replication in the splendour and grandeur of the prints on the clothes, realised with her proficient skill with unpredictable mediums such as watercolour paint, combined with acrylic paint and graphite. 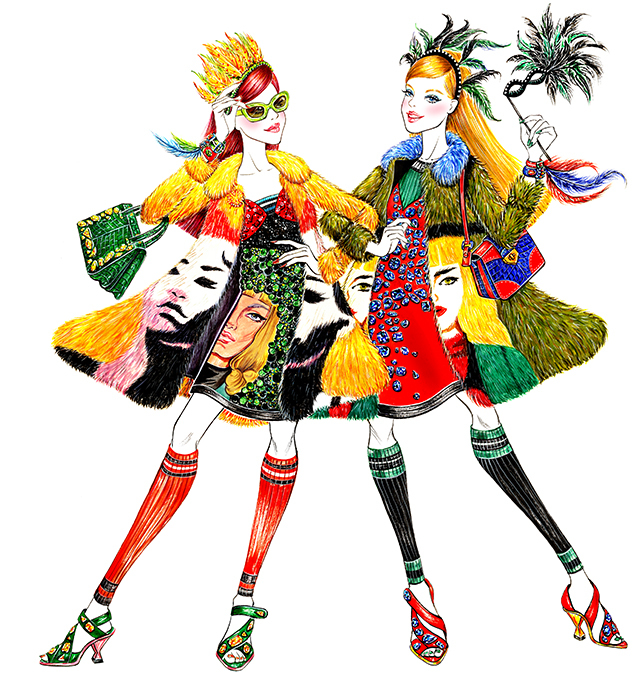 In the case of our collaborative piece, Sunny managed to devise a painting-like take on the sought-after Prada’s Spring/Summer 2014 collection pieces, complete with masquerade masks. Her incorporation of a stained glass effect on the flooring, embellished with colourful gems and rhinestones, and a midnight sky filled with lightning bolts gives the illustration a highly-stylised and stunning effect that is filled with wonder and excitement. If anything, a glance at her illustrations never fail to give off an optimistic vibe — something that all forms of art and fashion should aim to achieve. 1) Where do you live? Where and what did you study? SUNNY: I live in Los Angeles. I received my BFA from Otis College of Art and Design, majored in Communication Arts, Illustration. SUNNY: I was born and raised in China. I moved to the United States when I was 13. After encountering people from different backgrounds, I became very curious about other cultures. I learned to observe and discover beauty in everything around me. I wish to find a way to capture and preserve the beauty that I see, the kindness that I feel, and recreate them in some way. Since drawing and painting have always been my favorite things to do, I decided to turn my hobbies into my profession — that is to become an illustrator and artist. Fashion illustration was a found passion! I didn’t have much knowledge about fashion illustration when I first started, I realized I wanted to be a fashion illustrator during my senior year in college. I was interested in children’s book and stationary illustrations before, until one day I randomly came across a fashion illustration book in school library. That’s when I found my passion and dream profession! 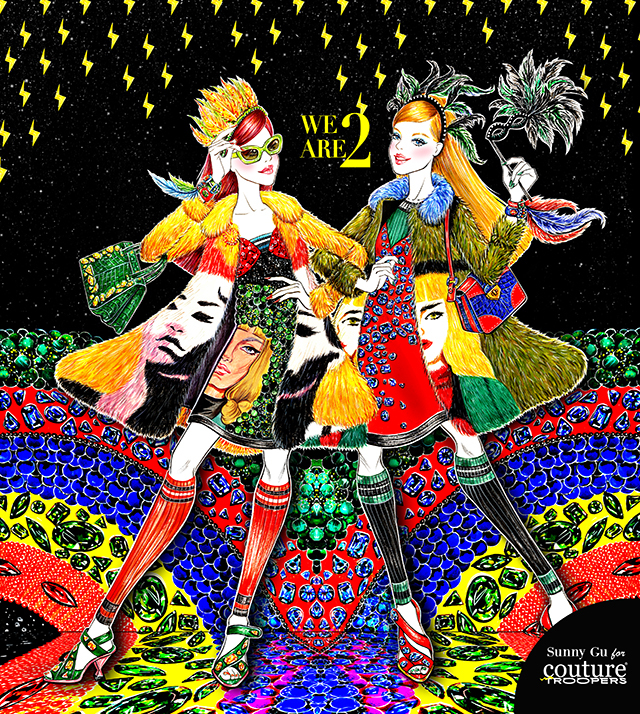 3) Your illustrations have always been closely linked to fashion looks from the runway. What transpire you to recreate them in your works? SUNNY: The intricate craftsmanship, ingenious designs, ever-changing trends from the runway never fail to impress and inspire me. Runway looks will always be a very important source for my inspiration. But as time goes by, what I wanted to achieve and the way I wish to reinterpret runway, has been drastically changed. When I first started, I illustrated runway looks exactly as they appeared in lookbook photos. I must have painted hundreds of them! The goal back then was trying to hone my skills and learn how to render different textures. Then I got bored and started to incorporate small elements into the composition such as changing the pose of the model, creating lifestyle illustrations, etc. During that phase, I was trying to see how the runway looks can be used as a element in the illustration, instead of merely drawing the runway look as my illustration. Now as I gained more experience and worked with different clients, I use runway looks as part of the mood board for my projects. I may or may not include design(s) from the runway into my illustration; but I gather inspiring elements such as the color palette, hairstyle, texture from the runway looks. 4) Your works are noticeably vibrant and cheerful. What do you aim to achieve with each illustration? SUNNY: When I paint, I am bathed in happiness, I hope my colorful illustrations can bring you some joy too! 5) Who are your favourite designers for the Spring/Summer 2014 season? 7) What are your thoughts on the rising realm of social media and how has it help for you as an illustrator, in reaching to more people in the world? SUNNY: I LOVE social media! I won’t have the honor talking to you right now if I didn’t have the lovely people helping me promoting my work on the internet. Social media has literally made my dream possible. So far, more than 99% of my clients have contacted me because they have seen my work somewhere online. The internet is so powerful and it makes it so easy to share with people from all around the world. 8) What do you feel is your biggest achievement to-date? SUNNY: Hmm, this is a hard question. For me, it is very difficult to name a specific project. There are high and low points in every project. It’s like a journey. The most satisfying moments are when I see my illustrations have been put to use in different applications for my clients. If I have to say, the biggest achievement to-date is as I become better at what I do, I come across more dream projects proposed by different clients. It’s a true bliss to have the opportunity to work with brands and people whom I have always admired. 9) If you weren’t able to do what you do now, do you picture yourself doing something else? SUNNY: Psychologist. I have always been interested in psychology and I love working/helping people. 10) If you were to pick a few words to describe your style, what would it be? All prints and illustrations courtesy of Sunny Gu. 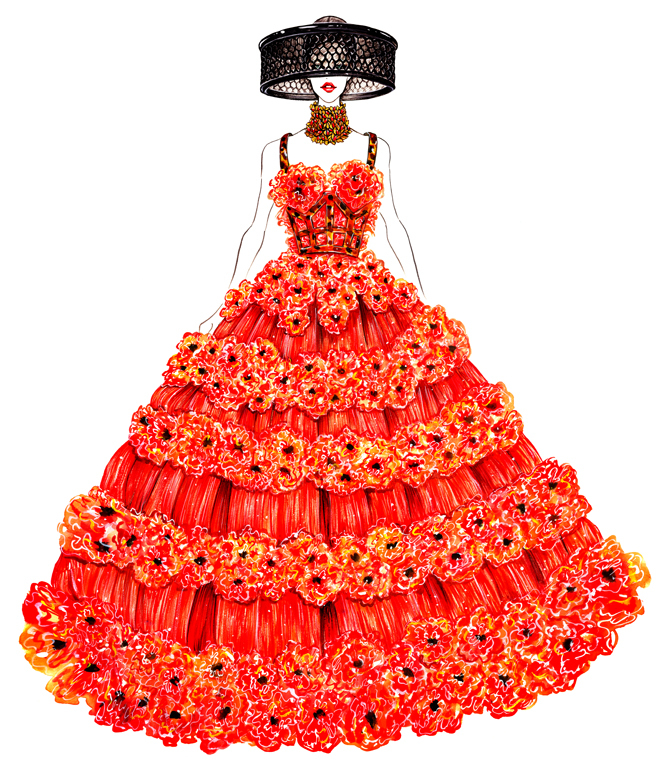 Next articleFashionAudi Fashion Festival 2014 Returns with Headlining Designer Oscar de la Renta and An Exciting Lineup! amazing work!! so inspiring for me!